The Series G DLE (Double Lite Edition) has been engineered with the aim to have the maximum flexibility in a single printing line. 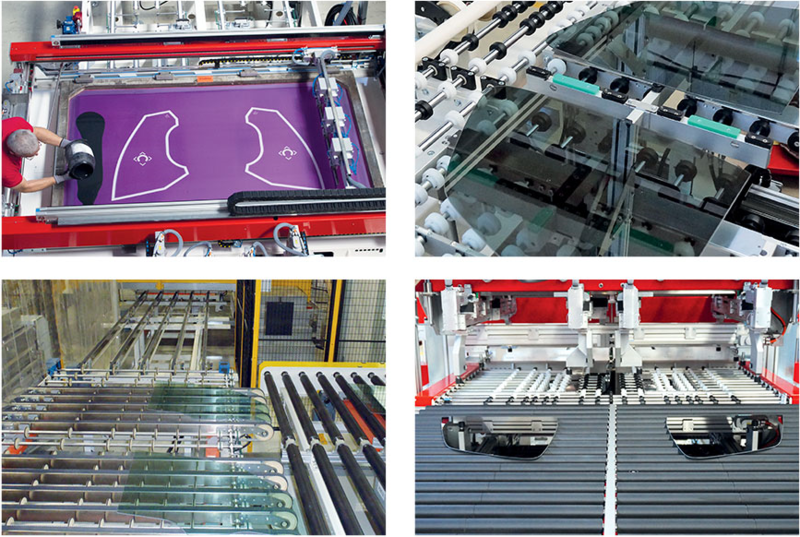 On one printing machine is possible to print two small glasses (sidelites or vents) or one single big glass (Backlite, Windshield or Sunroof). Its outstanding centring system is composed by 18 axes that allow to perfectly centre even extremely shaped glasses. The possibility to process on the same line two different type of glasses (i.e. Sidelites & Backlites) allows a great saving in terms of industrial space and cost optimization with a faster ROI. The DLE is available in different sizes, from vents size up to windshields. Its outstanding centring system is composed 18 axes controlled by brushless motors that allow to perfectly centre even extremely shaped glasses. • The system allows to insert into the recipe system the position of each pin. • The operator can also define the pins’ closure sequence, allowing the centering of extremely shaped glasses. • The precision of the centering systems can guarantee repeatability accuracy of 0,08mm. Cugher provides the right technological solution for the production. Your trusted partner for projects from scratch, integration and maintenance.